What was your favorite meal as a kid? Well, this was mine: Mushroom Stroganoff! I was a picky eater back then and I almost never finished a meal. However, when my mom made Mushroom Stroganoff I licked out the entire plate! I am not kidding! And no, I wasn’t vegan as a kid, I was vegetarian though. 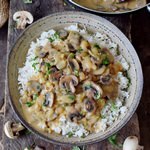 But it’s not difficult to veganize this meal and I am sure you will love my vegan Mushroom Stroganoff as much as I do. 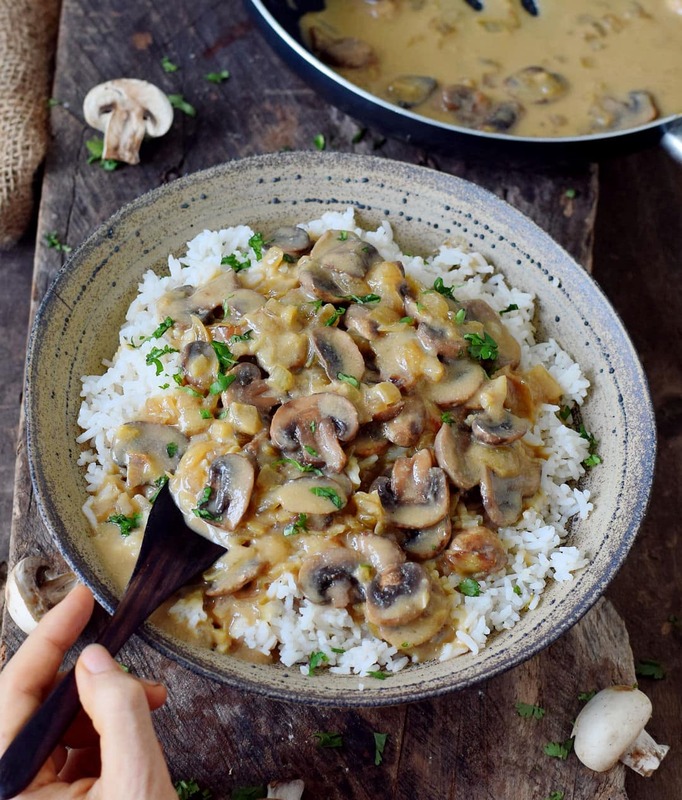 I adore mushrooms and vegan Mushroom Stroganoff will always remain one of my most favorite meals! The recipe is plant-based, gluten-free, creamy and flavorful. You will only need one pan to cook this easy to make comfort dish. 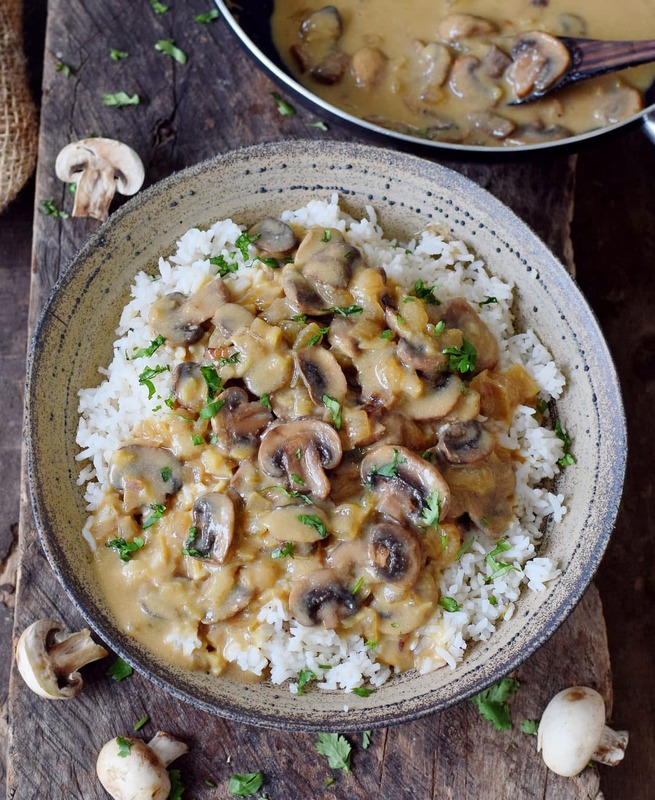 If you love mushrooms, then you should definitely also check out my Vegan Mushroom Risotto. 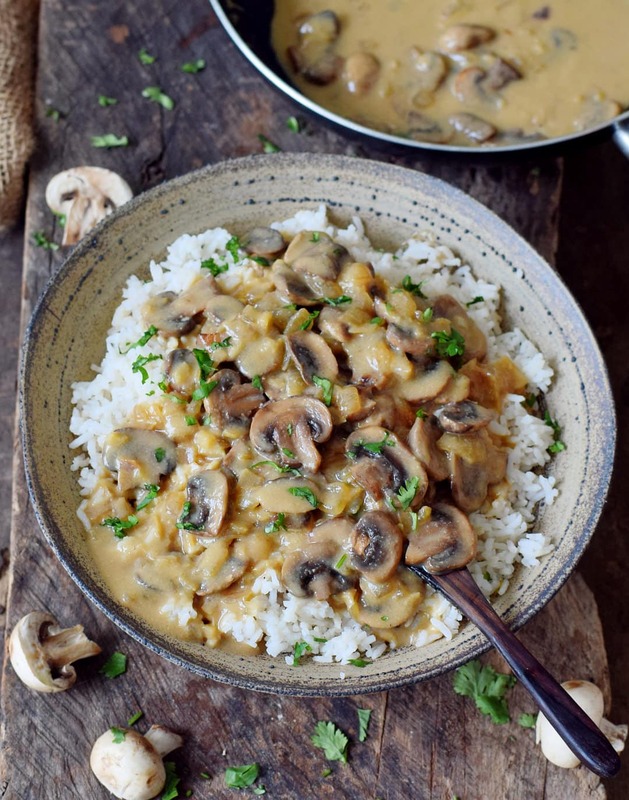 It took me only 25 minutes to cook this vegan Mushroom Stroganoff. From start to finish. It’s seriously very easy to make and I bet you already have most ingredients at home. So if you are looking for a quick vegan dinner or lunch, this easy recipe is for you! I tried out a few different Mushroom Stroganoff recipes in the past, however, most of them tasted quite bland. They actually contained just mushrooms, onion, garlic, and salt. Somehow all the spices were missing lol. I love to add different spices to all my meals. Onion powder, garlic powder, black pepper, and smoked paprika is a must. And since I also like spicy meals I often add red pepper flakes (chili flakes) as well. Of course, fresh herbs are very important. 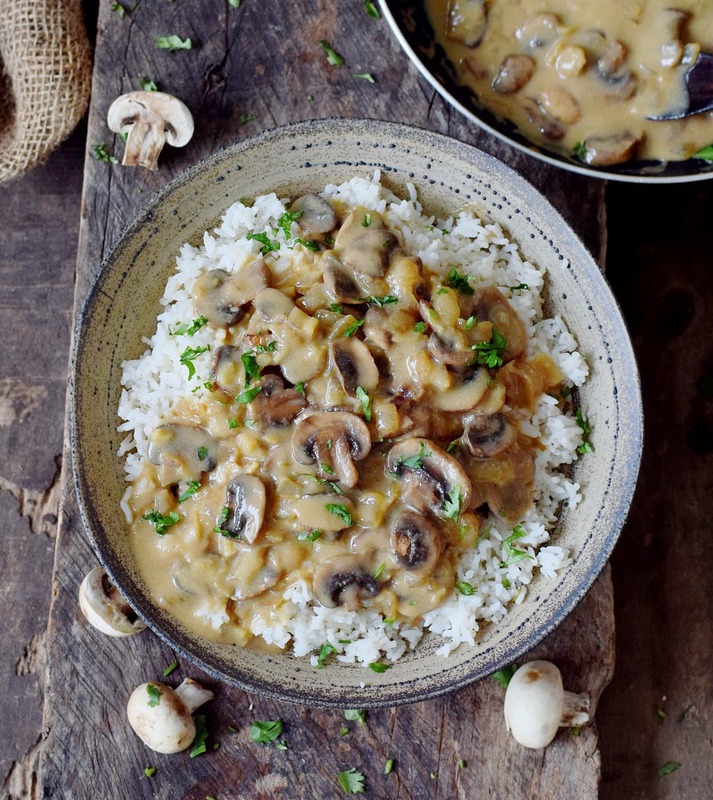 This vegan Mushroom Stroganoff tastes best with fresh thyme and parsley. I also love to add fresh tarragon but make sure not to add too much because it has an intense flavor. If you make this delicious dish and maybe even take a photo of it, then I would love to see it. You can DM it to me on Instagram. Don’t forget to tag me in your Insta caption + photo with @elavegan and use the hashtag #elavegan and I will gladly check out your post. This meal looks so good! ???? Mushrooms are my fave! Could eat them everyday !???? Thank you very much, Bianca! Mushrooms are simply the best! ???? Looks so good!! I’m making this!! Oh yummy! Im definitely going to try it out. 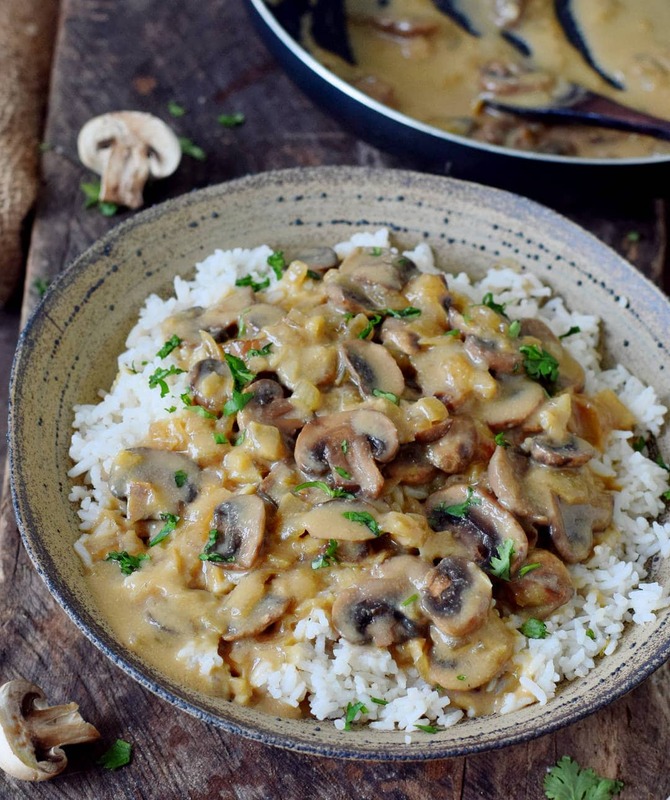 My bf is crazy about stroganoff, and I’m sure he loves the vegan version just as much. Thank you for inspiring! ???????? That’s amazing, Hille! I hope you will both love it. ???? Ooof this was so good, I adapted a little bit, using cashew cream instead of coconut milk. Made it a little spicy and served it with Jasmine rice and mango chutney. DELISH! Just recently became a Vegan (almost 2 months) and I came across your Instagram page and decided to sign up to your Blog. Your meals look so delicious and easy to make! 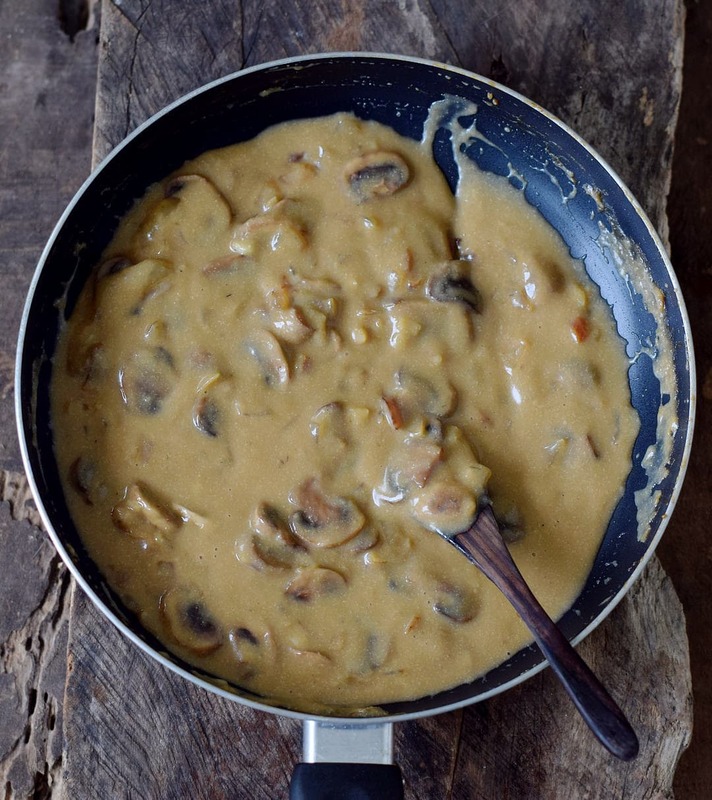 I think the Mushroom Stroganoff will be my first one to try! Love Mushrooms! Thank you for the inspiration!! Look so yummy!! Great recipe! This was awesome! Definitely going to be worked into our dinner rotation regularly. Omg! Ela!! This recipe is so delicious and easy to make… I had it for lunch today, just used mash potatoes instead of rice… so good!! Defiently a new addition to favorites!! Thank you ???? We have just finished this recipe with gluten free pasta. My husband leaned back and said, “Well, that was delicious!” I don’t think I need to say much more! I made a double batch for my parents as well, and they loved it. Thank you for such a wonderful and easy recipe! This will be a staple in my house! Wow, that’s awesome! Makes me so happy that your family enjoyed my recipe! Thanks for leaving such a sweet comment. Very good sauce for everything ???????????? Just reading this recipe is making me hungry!!! Can’t wait to give it a go!! I just made this and it’s my favourite vegan recipe yet! We had a spare aubergine so we threw that in too! Delicious and creamy with not a piece of dairy in sight! I tried this recipe tonight and it came out fabulous! I added some spinach and had it on a bed of brown rice….so yummy and filling! Thanks for sharing this recipe!!! Would this souce taste good with groats? Never tried it but I am pretty sure it would taste delicious! Is there a difference un flavor if you swap cornstarch with just regular all-purpose flour? Ohhhhh this looks so good! I have everything in my kitchen so I’m heading in there right now! Can I use rice milk for this recipe?? Made this recipe twice and it was delicious both times!! Thank you for the recipe ???? Oh my goodness this recipe is soooo freakin good!! Omg this was soooooo delicious ???? I loved it just wish I had doubled it . Thank you ???? Thank you for sharing your recipes 🙂 I am excited to try this recipe. My sons favourite dish is chicken Alfredo. I made this recipe tonight but added chicken and it was absolutely PHENOMINAL!!!! Hi Ela I cooked this today. It is very delicious and simple. Thank you for sharing. Delicious!!! You´re the best!!! Thank you for your inspiration. This was amazing!!! I’ve only made it to serve with pasta so far, but will try with rice soon too. So good! Hi I am a meat eater and I’m trying to start a vegan lifestyle. I know it will be hard to start right away/overnight so I will start by begging vegetarian for few weeks/months and then, hopefully, transition to a vegan lifestyle. Your recipe looks yummy but I’m not a fan of mushrooms, any other combination? This was sooooo good! We loved it and added it to our recipe collection for regular supper nights! Thank you! Just made it and I love it! I’m starting to become vegan and this is one of the first meals I’ve attempted and I’m so happy! Can’t wait to get my partner to try it. OMG! Thank you so much for the recipe! I just made this and loved it. It goes well with polenta. This one will definetly become a regular. I am trying to become a vegetarian and you are making the priocess so much easier than I expected. Super easy. Super creamy and super cheap. I doubled my coconut milk, reduced it a bit more and went 400g mushrooms. Because i love mushrooms. This recipe is delicious! My family loves it! I’ve decided that I am going to serve this to our extended family, for our Christmas Eve dinner this year. Looks amazing, can’t wait to try it. I think I may add some baby spinach and serve over cauliflower rice. Made this in two pans – one with mushrooms (for the vegetarians) and the other with chicken (for the non-veg) and made the recipe exactly as described and it was a hit with every member of my family. Thank you for an easy, delicious recipe! Great meal!! I added tofu ???? This looks delish! Can I use Cremini mushrooms? What kind of milk would you recommend for best results? I was thinking of using canned coconut milk. Awesome! Making it for Valentine’s Day for my mom & I; will report back! Ela, thank you for this recipe, so far I have made it twice and both time it was delicious. This is one of our family faovorite recipes! Its delicious, creamy, full of flavors and nutritious. I do it weekly and even my husband asks for it! Thank you Ella for your creativity and time in making these. Your recipes are foolproof and I cant wait to try more of them. I’m a horrible cook and we just became vegan after my husband’s bypass surgery. This is one of the few that have been a success on the first try. Thank you. This turned out great! I was looking for different ways to cook mushroom dishes because I tend to cook them always the same way lately. I love that you use lots of spices because I usually find online recipes too bland for my taste. This recipe will definitely be made over and over again. Thank you Ela. Awesome! I added lentils and served it over spaghetti squash. I also doubled the recipe and used coconut milk. delicious! wish i added less onion, but otherwise perfect! To die for!! We added a 1/2 teaspoon of gravox powder and used coconut cream. Im in love with this, I can believe I lived my whole life up until now without eating it. Definitely needs to be doubled or tripled though, only made about 3 servings and we added extra mushrooms. Loved this recipe, it made a very tasty supper! The first of many recipes I will make from your website, thank you! Made this today. It’s delicious and smells great. . This was the most amazing dish I had!!!!!!!!! My only regret is that my husband came home for dinner!